Manchester United and Tottenham lock horns in the Premier League tonight, with Jose Mourinho naming a conservative line-up for the clash. The Red Devils come into this match off the back off a disappointing away defeat to Brighton last time out, whilst Spurs arrive at Old Trafford having won their opening two matches of the new season. 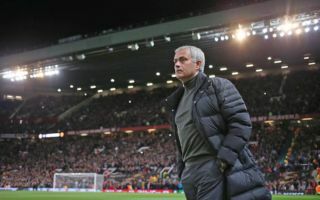 Mourinho’s men were outplayed last week by Chris Hughton’s dogged and determined Seagull’s during a 3-2 defeat, which left the Portuguese boss having to field questions about his future in the aftermath of the result. The 55-year-old coach was criticised once again for his negative tactics and failing to set his team up to attack, a theme which looks set to continue tonight. According to Sky Sports, the United boss has made six changes from last weeks game, with Victor Lindelof and Eric Bailly being replaced by Phil Jones and Chris Smalling, after their nightmare showing on the south coast. Anthony Martial, Juan Mata and Andreas Pereira have all been completely left out of the squad for tonight’s game, while Ashley Young drops to the bench. Antonio Valencia, Ander Herrera and Nemanja Matic all make their returns to first-team action, while Alexis Sanchez must make do with a place amongst the substitutes, as Mourinho has seemingly set his stall out to frustrate Mauricio Pochettino’s men. This team news has not gone down well at all amongst supporters, who have voiced their grievances on Twitter, as you can see below. Ah. I miss when we had a decent back line. I also miss when we used to attack. Those were the days. What an awful team that is. Cancerous Duo Smalling-Jones Is Back, We are Wrecked. Imagine dropping Lindelof-Bailly after just one bad game, more than that imagine thinking Jones-smalling is the Solution. New Season Same Old Bullsh*t.
Could another Mourinho masterclass be imminent? Or will Spurs manage to penetrate the stern rearguard in front of them to render his negative tactics useless? Either way, tonight’s contest will no doubt be a highly charged and competitive affair which could go a long way to deciding who will ultimately go on to become genuine title challengers this season.